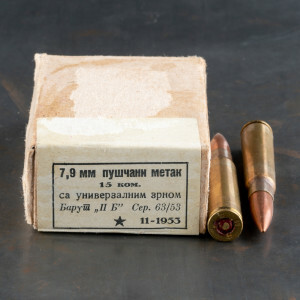 8mm Mauser ammo (aka 8 x 57mm JS) is a centerfire, rimless, bottle-necked, .323 caliber, rifle cartridge originally adopted by the German military in 1888 and this cartridge continued to serve the German military through WWII. 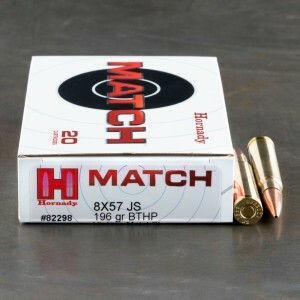 The original cartridge used a .318 diameter bullet (designated JRS) but, in 1905, the chamber pressure was increased along an increase in bullet diameter to .323". 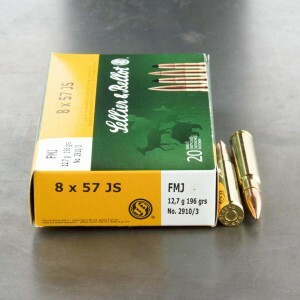 Therefore, the larger bore diameter is always designated as "S" or "JS" and thus, 8mm Mauser ammunition designated "JS" should not be fired in the older model 1888 Mauser rifle but is safe to fire in the stronger Model '98 Mauser provided that you have the correct bore diameter. 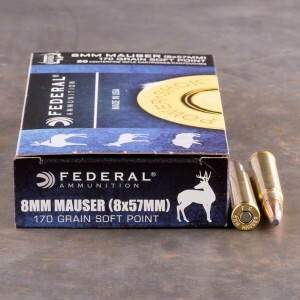 Although this cartridge is a popular sporting round in Europe due to the fact that its case dimensions are nearly identical to the .30-06, it has never been adopted by North American gun manufactures as a standard sporting cartridge. However, due to the large number of military surplus rifles sold in the U.S. since the close of World War II that are chambered for this cartridge, its popularity has grown considerably among civilian shooters. 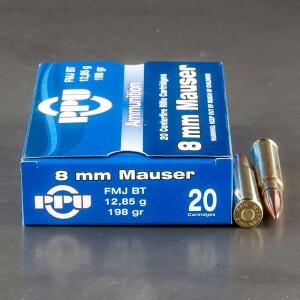 In fact, this cartridge is capable of firing a wide range of bullet weights ranging from 125 grain to 227 grain at muzzle velocities ranging from 2,300 to 3,000 feet per second making the 8mm Mauser capable of humanely harvesting most any North American game species provided that appropriate loads and bullets are chosen.